Above: Dan Ulduzu and Ashrafi Contract (l-r): Toshiro Tsunozaki, Japanese Embassy in Moscow; Jan Kalicki, U.S. Dept. of Commerce; Heydar Aliyev, President of Azerbaijan; T. Don Stacy, Chairman & President of Amoco Eurasia; and Marty Miller, Vice President of Unocal. 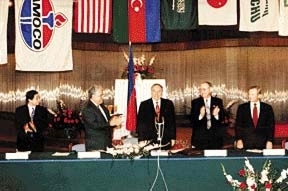 Azerbaijan and a consortium of foreign oil companies signed a $2 billion deal on December 14, 1996, for the development of the Dan Ulduzu and Ashrafi prospects, located in the Caspian approximately 30 miles off the Absheron peninsula. This 25-year contract is the fourth in a series of production sharing agreements between foreign companies and the government of Azerbaijan for oil and gas development. The contract parties include Amoco (30%), Unocal (25.5%), Japan's ITOCHU (20%), Saudi Arabia's Delta Oil (4.5%) and State Oil Company of Azerbaijan (20%), which together are forming a new joint operating company which will be called North Absheron Operating Company. The contract area covers 453 km, with water depths ranging from 75-200 meters. The fields are believed to contain reserves in excess of 1 billion barrels of oil and 65 billion cubic meters of gas. Below: Signing of the 4th Consortium Contract for Dan Ulduzu and Ashrafi prospects, December 14, 1996. First Row (l-r): Badr Al-Aiban, President of Delta Oil (Saudi Arabia); Heydar Aliyev, President of Azerbaijan; and Jan Kalicki, U.S. Dept of Commerce. Second Row: Marty Miller, Unocal (U.S.); T. Don Stacy, Amoco (U.S.); Koji Nojima, ITOCHU (Japan); Toshiro Tsunozaki (Japan). Third Row: Richard Kauzlarich, U.S. Ambassador; Murtuz Aleskerov, Speaker of Parliament; Mrs. Anne Kauzlarich. 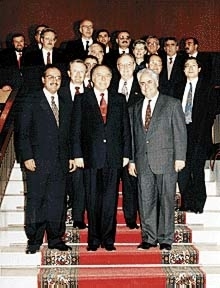 Top Row: Osman Kaldirim, VP Delta Oil; Arif Rahimzade, First Deputy Speaker; Tahir Kerimov, President's Interpreter; Artur Rasizade, Prime Minister; Vafa Guluzade, Presidential Advisor; Ramiz Mehtiyev, Head of Presidential Staff. Azerbaijan's President Heydar Aliyev was present at the signing of this contract, which took place at the customary location at the Gulistan Palace in Baku. Aliyev stated that he views the signing of this contract as evidence of America's growing interest in Azerbaijan. This was confirmed by U.S. Vice President Al Gore, who telephoned President Aliyev to say that the Clinton administration considers the U.S. and Azerbaijan to be strategic partners in the development of the Azeri oil sector and that they consider this latest contract to be of the utmost importance. Bonus payments of $75 million will be paid to the Azerbaijani government upon successful completion of various phases of the project. To become effective, the contract must be ratified by Azerbaijan's Parliament. The minimum work commitment for the Dan Ulduzu and Ashrafi fields includes a 3-D seismic survey and the drilling of three wells over the initial 3-year exploration period. If exploration proves successful, total capital investment in these fields could exceed $2.5 billion. First production is expected by 2003 with an output of 7 million tons per year by 2007. All five consortium members are partners in AIOC (Azerbaijan International Operating Company), which is developing the Azeri, Chirag and deep-water Gunashli prospect signed in 1994. The second consortium contract (1995) involves the Karabakh field being developed by Caspian International Petroleum Company (CIPCO). The third contract (1996) involves the development of the Shah Deniz prospect being led by British Petroleum. The combination of all four projects brings the total Western investment in Azerbaijan's oil fields to over $12 billion.